Double bassist Jessica Valls is an Austin, Texas-native musician who exemplifies the artistry of a true music lover, focusing not on just one genre, discipline, or stage. 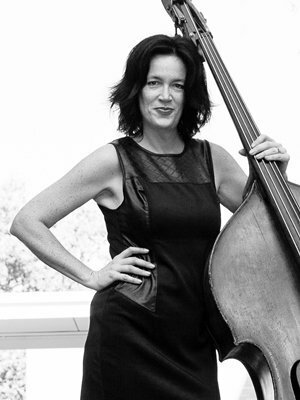 Performing regularly with several orchestras including the Austin and San Antonio Symphonies, Jessica is previous principal bassist for Orquestra da Rádio e Televisão Cultura in São Paulo, Brazil, and enjoys traveling to Brazil to perform and teach. She appears with chamber ensembles, jazz, tango and bluegrass bands, in studio recording sessions, on film soundtracks, television and radio jingles, and on popular festival stages around the world such as The International Festival at Round Top and Encontro Brasileiro de Contrabaixos in Goiânia, Goiás, Brazil. A repeat presenter at the International Society of Bassists Convention, Jessica’s solo performances can be multi-instrumental, vocal and percussive. The use of multi-media tools allows her to expand her repertoire and performance venues, adding to the growing pool of new works for solo double bass. Formal studies include Juilliard, Oberlin, Manhattan School of Music and University of Texas at Austin where she completed a Doctor of Musical Arts degree in 2010. Jessica is a regular guest artist and clinician at the North Texas Bass Camps, the Austin Chamber Music Workshop, Oklahoma Summer Arts Institute, and Victoria Bach Festival. Currently Dr. Valls is on the faculty at Southwestern University, Huston-Tillotson University, and The Girls’ School of Austin. She also maintains a private studio for budding string players of all ages.